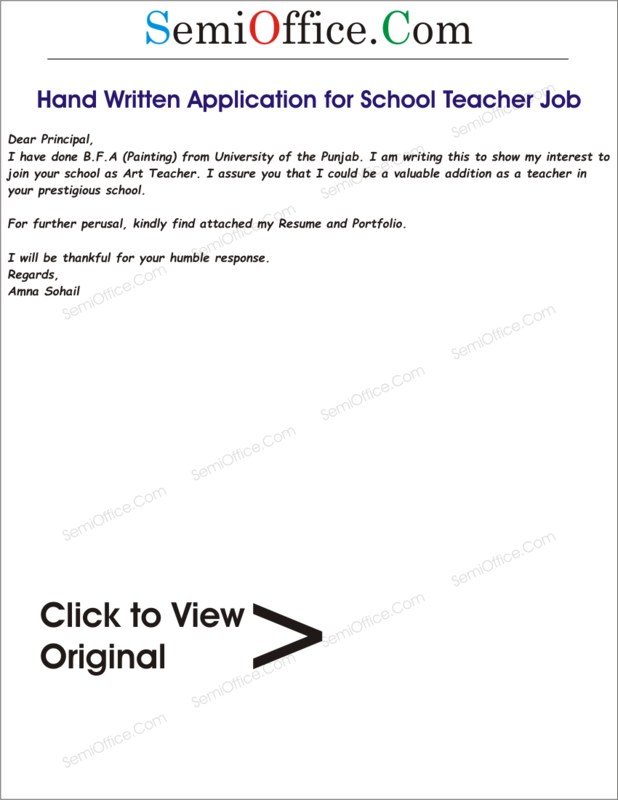 13 Teacher Job Cover Application Letter samples to learn how to write application letter for school teacher job. Respected Madam,I am an energetic, highly motivated, enthusiastic and MSc qualified, looking for a challenging designation for teaching sincerely, to contribute with best of my skills as well as learning to enhance my abilities, skills and potential in a learning environment. At present I am teaching in Allied School as Biology Teacher. Kindly give me the opportunity to teach in your well reputed school. I shall be grateful to you. 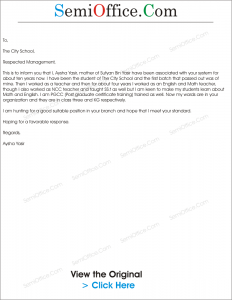 I would like to apply for a suitable position in your educational institution. I have done BS Hons in Environmental Sciences from School of Economics. I have heard about an available position for a teacher at your institute. I would like to put myself forward for this great opportunity. It will be a great honor for me to be part of your institute. After my selection, I will put all my hard work and dedication to achieve the objectives and goals which are required by the Institute. I hope to hear a positive reply of my application from you. I want to apply as a resource member in your institution. I have previously taught at Scarsdale and Alma, Smart School and Defence Lyceum. Also, I have researched on child psychology with Dr. Aftab. I would like to be part of Sun Institute. Let me know if there are any vacancies. I have come to know about job vacancy in your school. I have masters in botany as a gold medalist and I have teaching experience of two years and also good teaching methods too. I am very much determined towards my work and career in teaching. Please give me a chance for teaching in your school, so I will show you my performance. I have attached my documents and CV with application. kindly have a look on my application and grant me a chance for interview to present myself. I have done B.F.A (Painting) from University of the Punjab. I am writing this to show my interest to join your school as an Art Teacher. I assure you that I could be a valuable addition as a teacher in your prestigious school. For further perusal, kindly find my attached Resume and Portfolio. I will be thankful for your response. With due respect it is stated that I am working in a notable institute as a junior teacher of class Nursery and k. g right now. Sir I wanted to apply as a teacher for your prestigious school. I have experience in this relevant field. Hope you will find this letter in good of your health. 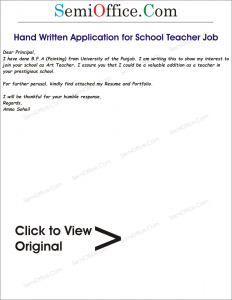 Sir my name is Jon Smith and I am writing this letter to apply for the job of teacher. I read your ad regarding the requirement of an Assistant professor. I just graduated from a very reputable institute. My major area of study was computing and I have a very good hold on almost all the subjects relating to computing as well as I have a very good grip on mathematics. I have a passion for teaching and I have also taught in various Summer School for kids. I have also taken teaching courses which also gives me a grip over other candidates as I better understand the psychology of the students. At this stage of my life I am looking for a profession to pursue and achieve something good out of it. I hope that you will shortlist me and give me a chance to pursue my dreams. My official transcript and my resume is attached with the application. Hope to hear well from you. I heard a lot about the reputation of your school with respect to your managerial abilities. One of my sisters is your student; she told me that you warmly welcome the new educators who want to be a part of your institute as a teacher. I am one of those who want to be a part of your teaching team to achieve your educational goals of best education and enhance my pedagogical skills under your kind supervision. I am sure that I will apply my learning more effectively and produce the efficient results. I have done B.Ed(Elementary) with the CGPA 3.39 and looking forward to you for kind response. I will be very thankful to you if you will give me chance of interview. With reference to your job advertisement in Daily Times. I would like to submit my CV for email subject cited post in your prestigious college. I am a Graduate in the field of business administration from a reputable University with a high distinction in studies. I am a hardworking, intelligent and self-motivated individual with high confidence and leadership skills. I have a sum of 4 years of experience in the teaching field. The required experience mentioned on the advertisement was also 4 years. So it makes me very much eligible for the desired post in your college. Please find attached herewith this email my up-to-date CV at your perusal and your further necessary action please. You will find my credentials in the CV perfect for the mentioned job. Kindly have a look at my CV for further information. Looking forward for response from your side and an interview with your good self if shortlisted. 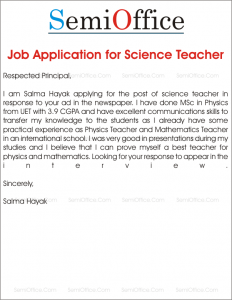 I am Hameed interested for teaching of biology and chemistry in your school on the vacant positions advertised in newspaper. I have completed MSc Biology and Chemistry from DU with five years of teaching experience in well-known and reputed institution of this area. My service certificates are attached for your review. As a teacher I can perform excellent in teaching as well as good in handling the students in class. I wish to appear in the interview soon. I Sumaira Ainee like to express my interest in teaching at London Grammar School. Please look over my enclosed resume. I would greatly appreciate an interview at your earliest convenience and look forward to meeting with you concerning a career of teaching to special children to discuss the positive contributions I could make. Sir, I am writing this letter in respect to the job vacancy advertisement that you posted in the newspaper requiring a teacher for accounting. I wish to apply for the same. I have done Masters in Accounting and Finance and I have been working with a multinational organization for 2 years. Let it be teaching other colleagues or children of my own, I came to realize that teaching is my ultimate line of work. Therefore, I wish to work at your institution. I have attached my CV with this cover letter. Thank you for your consideration. I wish to hear from you in the near future. i love this teacher job. I need the best format for educational C.V.